Jack has been into hitting the golf ball lately so we signed him up for Tiny Tour on Sunday afternoons. Saturday night we headed to Golf Galaxy to purchase his first set of clubs. Obviously he's pretty excited about this golf thing! I love it!!! What a sweetie...future Tiger, perhaps? 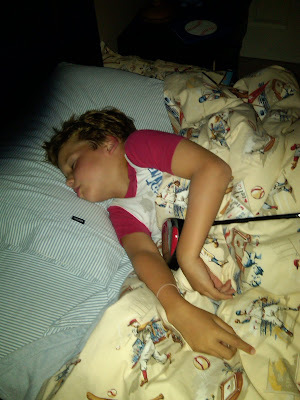 I love that he is sleeping with his golf club!!! I knew I loved that kid.